Rocksbox - First Box — Always Packed for Adventure! In September, Dan and I were invited to an amazing Timothy Oulton dinner in the Blue Room at the Historic Los Angeles Athletic Club. It was formal and I needed a clutch. After much searching and stress, I still couldn't find that perfect accessory. I did, however, discover a company called Rent The Runway. Rent the Runway is brilliant. I was able to rent this gorgeous Kate Spade clutch for just a fraction of the retail price. Shipping and insurance were included in the rental. The process couldn't have been easier and the clutch was in excellent condition. After test-driving it for the evening, I fell in love. Returning the clutch was depressing. The happy ending, is Dan has just bought it for me ( a brand new one) for our Anniversary present! I plan to take that thing everywhere. It's just so darn sparkly and pretty. My great experience with Rent the Runway got me wondering if there were other similar services. I searched the internet and came across Rocksbox. Rocksbox is a costume jewelry rental company. Unlike Rent the Runway, you do not choose specific pieces. For nineteen dollars a month, you get a box with three pieces of jewelry to try. When you are finished, you have the opportunity to purchase any of the pieces for a slight discount. You can also mail back all three and have a new box sent. The monthly fee covers shipping ( both ways), insurance, and allows you to get as many boxes as you like. It's similar to Netflix, you mail it back, and as soon as they receive it, your next box is on its way. I've only recently started to accessorize. For years, I didn't wear earrings and my piercings closed up. In general, in my daily wear, I couldn't be bothered with any more jewelry than my wedding ring. However, I started to pay attention to various friends who fantastic at accessorizing and I admired the way that they pulled their outfits together. I also had a short stint at Nordstrom, where accessories were mandatory. Two years ago, I began working with a personal shopper, which expanded my jewelry collection. I'm starting to see how dressing up on a regular basis is fun, rather than a chore. Compliments help! 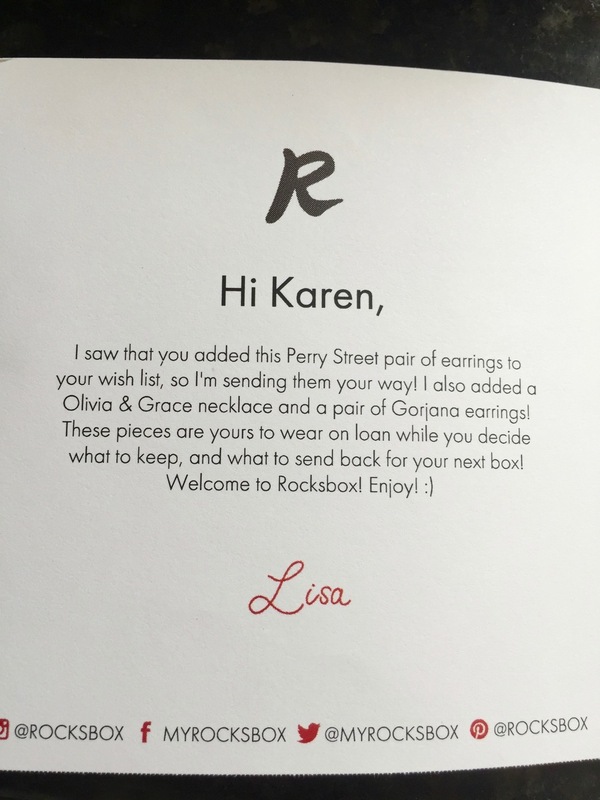 I like the idea of Rocksbox, as a way to check out jewelry before purchasing. When I'm out shopping, it's difficult to know if something will really work with my wardrobe. Now, I can borrow the pieces and play dress-up with what I already own. 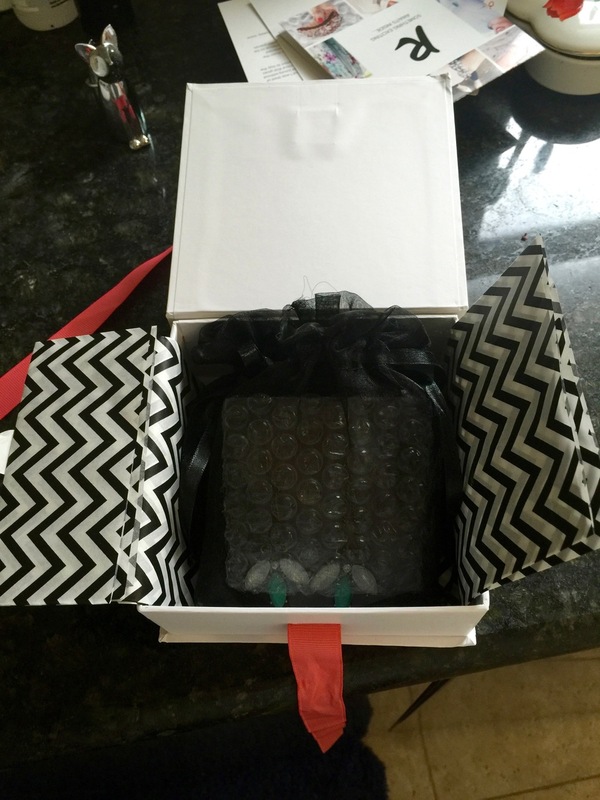 How does Rocksbox know what to send? When I registered, I took a style survey and explained what I tend to like. I also was able to look through their current offerings and mark certain pieces as favorites. From there, a jewelry stylist curated a box. Rocksbox encourages frequent updates of wish lists, as they are constantly adding new items. In the two weeks that I've been a member, I've been surprised by turn over. My first box arrived within a week. It came in a padded envelope, which is reusable for the return. A prepaid postage sticker is inside. When you're done, you just reseal everything and drop in a mailbox slot. Super easy. Here is what it looked like inside. Ignore the sloppy bow, it looked much nicer when they tied it. This picture was taken just before I returned the box. When it arrived, I couldn't wait to open it, so I tore in without documenting the box. Snazzy tissue paper and a custom sticker. Each piece came tucked inside a protective bag. 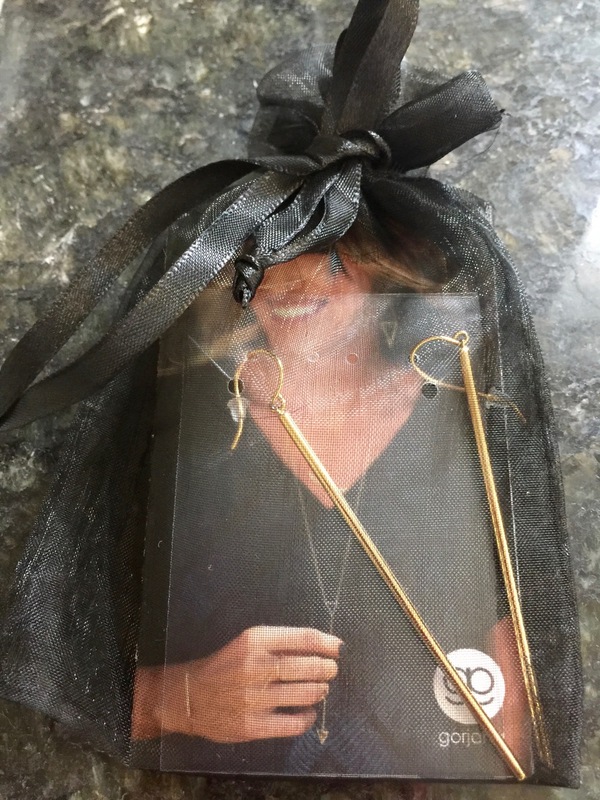 I had a personalized note from the stylist that created the box, including information on each piece. 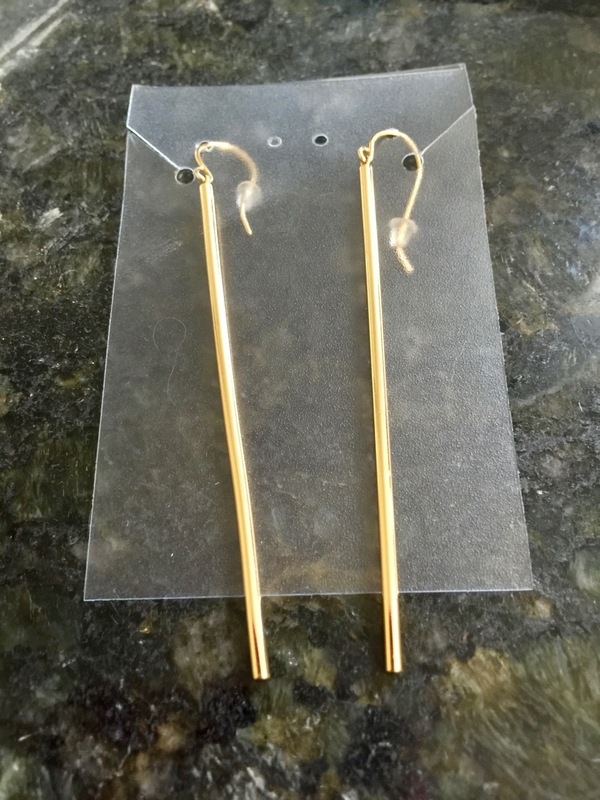 The Gorjana Bali Tube Drop Earrings were not my taste. However, in the name of keeping an open mind, I tried them on. I think that they would be cute on someone with a short hairstyle, that would really show off the earrings. In my long, light brown hair, they got lost. 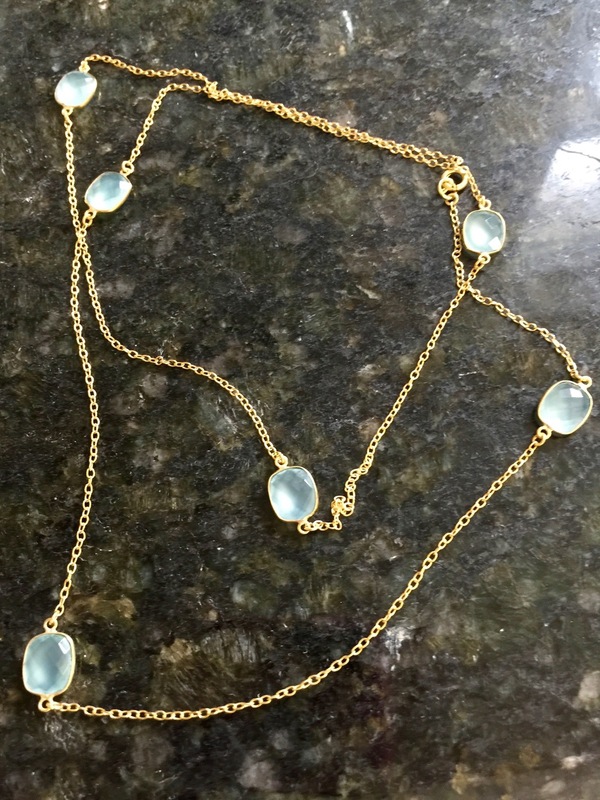 The Olivia & Grace Avery Necklace in Aqua Quartz was very pretty. I love the light aqua stones and it was flattering. Ultimately, it wasn't a keeper, because I already own a very similar Kate Spade necklace. 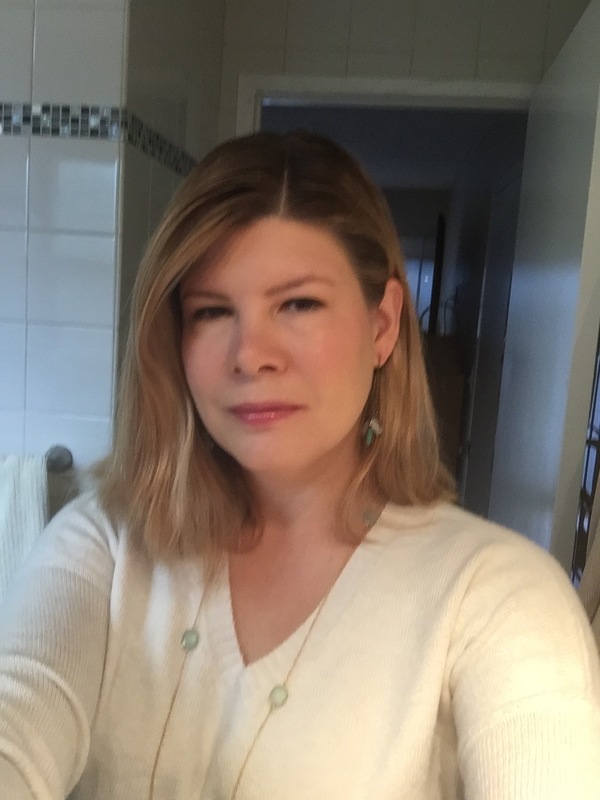 When I tried to take the picture ( on my own, in my bathroom), I couldn't get the angle right to show the full necklace. I tried taking the shot using the mirror, but it didn't turn out right. This was the first time that I EVER thought that a selfie stick might be a good investment. A selfie stick or longer arms. The Perry Street Stella Earrings were an item that I had favorited. Indeed, they were my favorite item in the box. The stones really popped and they were a great compliment for many things in my wardrobe. When I tried wearing them, they were very heavy and a touch too long, so they had to be sent back. After returning the box, I rated all of the items and left a note for my stylist. The idea is that they should get better at curating for your style over time. I plan to keep this experiment going for a few months to test it out, hopefully picking up a few great pieces along the way. Another bonus, Rocksbox credits every account with ten dollars a month in spend cash. They aren't at all pushy with selling, but I'm guessing that's their ultimate goal. I'm game. I mailed my box on Tuesday afternoon, and by Thursday afternoon, a new box was on its way. I have a tracking number to follow its progress. Fingers crossed, I will have the new box of jewelry to take on our Vegas weekend and another blog post next week.